With the so-called end of the Mayan calendar upon us — and the associated predictions, which range from an apocalyptic scenario of fireballs and volcanoes, to a more gentle “new age of transformation” or opening of consciousness — I cannot help but wonder about our attraction to doomsday fiction. Because it is a fiction. Even the Mayan story is a fiction, born of cultural misunderstanding and faulty translation, seeded half a century ago by an American anthropologist and author, Michael Coe. While other workers have since discredited Coe’s apocalyptic interpretation of the Mayan calendar predictions and the December 2012 date, our culture seems to want to latch on to these doomsday stories anyway. And it is not only the Mayan doomsday fiction that attracts us. Last year, there was Harold Camping, whose May 21, 2011 end-of-the-world date (believers would enjoy the Rapture and ascend to heaven, while the rest of us sinners would suffer months of natural disasters before the planet finally ignited in a fireball) came and went without incident. It’s not Camping’s predictions that surprise me so much — there are a lot of nutcases out there — it’s the attention we all granted him. We love the doomsday story. Look at the novels we read, the films we watch, even the stories we give to our children. Doomsday or apocalyptic fiction has been around for a century or more (with early authors such as Mary Shelley, H.G. Wells, and Jack London; and mid-century adopters such as Kurt Vonnegut Jr., Ursula Le Guin and Margaret Atwood). However, it seems to me that the doomsday story has moved from being one genre of many, to becoming a major theme in our story-telling. There are the stories where a pandemic has reduced much of humanity: Atwood’s Oryx and Crake (2003) and The Year of the Flood (2007), or films such as I am Legend (2007; adapted from the 1954 novel by Richard Matheson) and Contagion (2011). 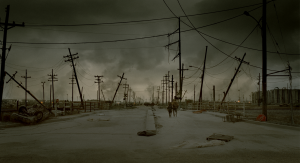 And there is Cormack McCarthy’s post-apocalyptic The Road (2006 novel, 2009 film) — we’re not sure what happened to the planet, but it was bad. What is disturbing to me is that we are telling these stories to our kids. Not that dystopic fiction should be censored, not at all. But it just seems that children’s narratives should be more, well… happy. The Hunger Games is the obvious example here: Suzanne Collins’s trilogy of novels published in 2008, 2009 and 2010, and the film released in 2012, replete with child-on-child violence and cute little girls being killed. But there are more: Moira Young’s 2011 YA novel Blood Red Road, and Meg Rosoff’s 2004 YA novel How I Live Now, which is scheduled for film release in 2013. The stories that speak to us most are those that reflect our own reality. And that, I believe, is where our current fascination with doomsday or the apocalypse comes from: a (possibly subconscious) awareness our own reality. This September, Arctic sea ice hit its lowest areal extent since measurements began (and probably its lowest level in at least 6,000 years). This November was the 333rd consecutive month with higher-than-average global temperature. (Perhaps it is time for us to recalculate what we call “average”). Research published last month shows that sea level is actually rising 60% faster than IPCC predictions. Even for those who don’t read the studies, or who don’t trust the scientists, the facts are becoming too difficult to avoid: as the USA suffers through the hottest year in its history, and with nearly half of the country under “severe” drought conditions (yes, even in December! ), and with thousands of people still displaced in the aftermath of Hurricane Sandy. Fiction is fine. I worry, though, that some people use fiction not as a reflection of our reality, but as an escape from reality. Because if you are looking for a doomsday story, you need look no farther than out your window.